Between May 2002 and August 2004, I worked for an event marketing company near San Francisco. I worked for nearly 18 months straight before I took any time off, so I had saved up enough vacation days to tour Europe for four weeks at the end of 2003. I started in Holland for about a week, then Belgium. On 23 December I left my B&B in Brussels and headed to the train station for the 8 hour ride to Zurich. I had some time to kill so I wandered around a bit. When I got on the train, I discovered that someone had managed to open my backpack, extract my brand new iPod, and leave everything else (thankfully) untouched. It was the longest train ride of my life. When I finally reached Zurich, I was feeling pretty low. Despite being a seasoned traveler, I must have let my guard down just long enough to become a pickpocket victim. I was on my own, which didn't really bother me, but all of a sudden it hit me that I would be alone on xmas. 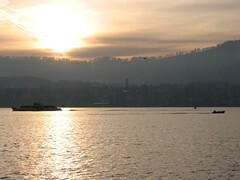 Zurich felt colder, less friendly, more sterile than Brussels or Amsterdam - maybe it was just the time of year. Funnily enough, I was disappointed that it was not snowing. I had wanted to visit a winter wonderland, but instead I found grey buildings lining grey streets. The lake, however, was beautiful. And as I wandered around over the next few days, Zurich grew on me. The museums and cinemas were open on xmas day - I watched the film Whale Rider and enjoyed the fact that I had access to entertainment in English. After Zurich, I went to Torino, Italy; then Venice for New Year's. I ended the trip with a few days in Bologna, and flew home via London. By the time I got back to California, I decided that I was ready to make a change. Over the next few months I hatched my plan, and in September 2004 I moved to London to do my Master's. While I was on my trip I wasn't sure what the future held for me; a few months later, I decided to make my own future.